Originally released on a label called Betley Welcomes Careful Drivers (I'm not sure when), this split release between Old Bombs and Wolf Eyes has been reissued by Public Eyesore as a split CDR. Old Bombs travel down the abstract noise collage road. But while harsh walls of noise are very much a part of what they do, it's only one of several elements that Old Bombs utilize in sculpting their work. A variety of noise patterns are combined with more tonal electronics... sort of like a UFO hovering over a 20 car pile up. There's even some actual melody worked in as well as some less then harsh atmospherics. But overall it's a 15 roller coaster ride that is at various times quirky, zany and intense. It's a wild ride indeed, but Old Bombs seem to communicate a sense of avant carnival in the engine room styled fun. Wolf Eyes' contribution is similar, but has more of an experimental spacey noise rock ‘n roll freakout style and also has hints of free-jazz. Hell, there's even a sense of rhythm at times that may not get your toes tapping or your head banging but you may feel inclined to jump to your feet and scream or maybe punch someone. The first vocals I hear sound like rapping that makes it seem like a dense industrial hip-hop jam. But it soon transitions to angry ranting vocals against a maddened electronic space dance. There's really quite a lot happening across this 27 minute piece. It's called WCBN 2/8/2001 so I gather it was recorded live on the radio and I can just see the folks at the station squirming. 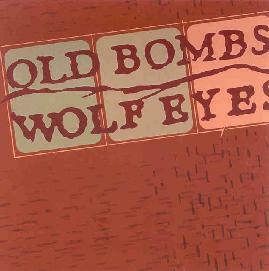 Both Old Bombs and Wolf Eyes contributions are difficult, but it's interesting stuff if you're willing to put on the headphones and give it a close listen.